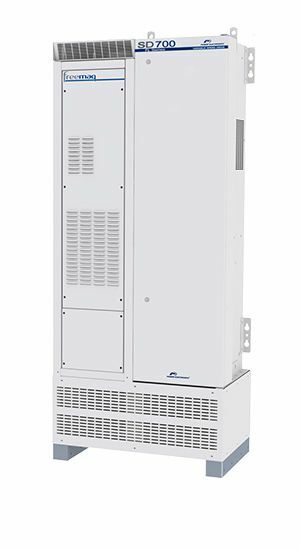 The unique features of the Variable speed drive SD700FL are improved via adding an input notch filter that reduces the THDi to below 5%. It is achieved through the parallel connection of individual filtering modules, all controlled and monitored by the drive. Each module integrates temperature sensors and a contactor that isolates the long-life integrated capacitors. This contactor is controlled by the drive depending on the motor load. What makes the SD700FL different? The filtering features do not depend on the grid impedance. This means that the filter will never cause resonance where the passive filter could, and its performance will not vary significantly after electrical grid modifications. This feature makes it suitable for any low harmonic application.